French painter, a pupil of Jacques-Louis David. In 1793 he left Aix with the local Socit Populaire to assist in the siege of Toulon. He worked as a draughtsman with the artillery battery; his autobiography provides a vivid account of his experiences during the siege and destruction of the town. On a subsequent tour of duty he was employed to paint republican motifs on ships in the naval base at Toulon. 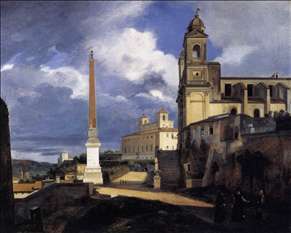 Granet spent the years 1802-19 in Rome. 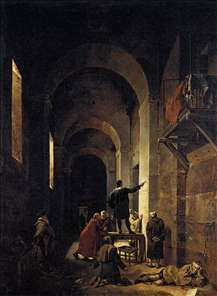 Here he earned his living selling drawings of ancient monuments and painting biographical events from the lives of famous artists. He made a speciality of sombre tonal effects and changing light in dimly lit interiors, his highly individualistic style recalling Dutch interiors rather than the Neoclassical tradition in which he was trained. 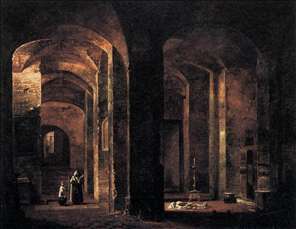 His Choir of the Capuchin Church in Rome was exhibited at the 1819 Salon with such success that he made sixteen replicas of it. 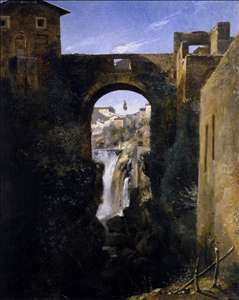 Granet also painted Italian landscapes, constructed with firm, cubic volumes in which some critics have seen a foreshadowing of Czanne. He reached the height of his success when he was awarded the Cross of the French Legion of Honour and the ribbon of the Order of Saint Michael. In 1826 he became curator of the Louvre Museum and was made Keeper of Pictures at Versailles in 1830. During the Revolution of 1848 he retired to his native Aix-en-Provence, where he founded the museum which bears his name. It contains a celebrated portrait of him by Ingres. See more details about "Crypt of San Martino ai Monti, Rome"
See more details about "Stella in Prison"
See more details about "The San Rocco Bridge and the Grand Waterfall at Tivoli"
See more details about "S. Trinità dei Monti and the Villa Medici, Rome"